Translation: Meiko Maruyama, the Conservatorium Hotel, with the same passion and dedication. She has a unique energy and a special connection with the city. Let´s follow the wonderful tips about Amsterdam she is sharing with us. Please introduce yourself and your activity. 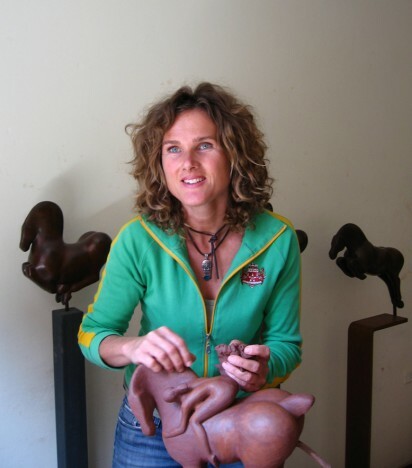 My first name is Ninón, I am an artist making bronze sculptures, but I also ‘translate the eye’ into expressions of feelings making paintings, photographs, or doing styling for interiors. This year I have been very busy with the styling of the new Conservatorium Hotel in Amsterdam. I work together with my sister, Alexandra, we are the ones that search for beautiful ideas, objects, furniture, art, light etc. for the interior – 140 suites, restaurant, brasserie, lobby, spa- of this incredibly beautiful place designed by the Italian architect Piero Lissoni. How does it feel to be the stylist of such an impressive project like the Conservatorium Hotel? Every time we walk into the lobby, we ask ourselves again, how can a big space feel so calm and comforting as if it were a warm blanket, isn´t it amazingly beautiful? Many times we have been doing our work in the hotel at night, placing objects or hanging things on the walls, as then we do not disturb guests. We had quite some magical moments. When we started the project we still had to enter the building with a helmet as everything was under construction. We saw it evolve and created our ideas evolving with it. It feels like a special adventure. Could you tell us about your city? What do you think about it? The special thing about Amsterdam is that it is a world city and at the same time it is a tiny village, where the rhythm of life is dictated by the pace of a bicycle in the narrow streets, or a little boat on the canal. Are you working in your art at the moment? What are you doing? I am making a huge sculpture for the hotel at the moment, it is not finished yet, it will be 3 meters long and will be placed on a floor leading towards the spa. I already made a bronze dog that is sitting in the tree pit in the gym of the hotel. Furthermore I have my usual exhibitions in art galleries, for example at gallerie Smelik & Stokking. Please tell us about your favourite places in Amsterdam. I like the Jordaan best to stroll around for it´s atmosphere. For events I like things that are organized around the Westergasfabriek. Of course for music concerts the best is Paradiso. If I want to pretend I am on a holiday in my own city, I like to go and eat tapas at Duende at Lindengracht. If I want to pretend Amsterdam is a bigger city then I can eat at Dauphine. Of course, a coffee should be taken at the lobby of Conservatorium Hotel.